Windswept Vistas -Pet Friendly, 5-min from ASU, Hot Tub, Views! 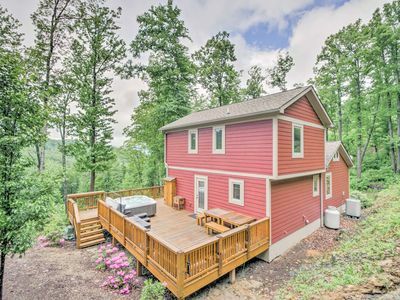 Spacious four bedroom cabin just minutes from downtown Boone and ASU, with lovely view, cozy gas fireplace, central AC, firepit area, hot tub, ping pong, second kitchen - always a guest favorite! 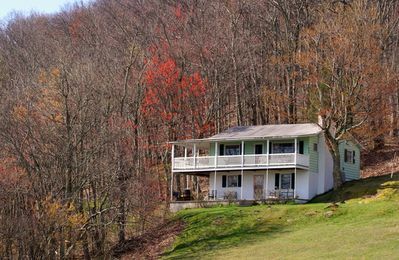 Sitting atop Snaggy Mountain is Windswept Vistas – where each of the four bedrooms has its own deck to enjoy the panoramic views. 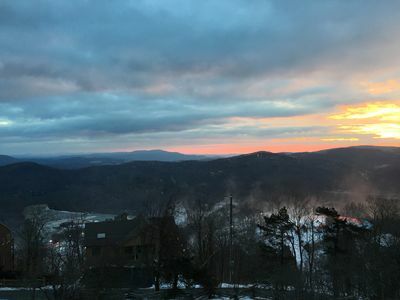 Located in Boone NC just five minutes from historic downtown and Appalachian State University, it is still less than fifteen miles from both Blowing Rock and Banner Elk as well. 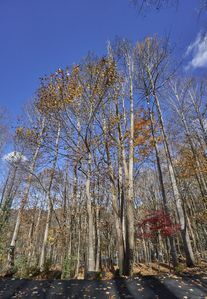 Throughout the home, Windswept Vistas displays the quality and planning that most homes aspire to. 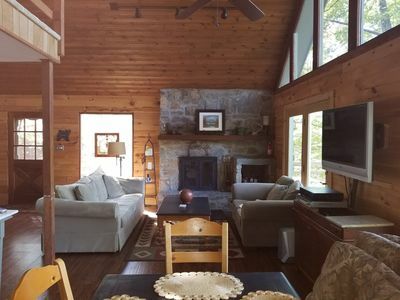 As you enter this cabin, you are immediately torn between which to admire first – the wonderful views easily enjoyed through the many large windows, or the forty foot stacked stone fireplace that is the centerpiece of the comfortable living area. The lovely leather and upholstered furniture is both stylish and conducive to relaxing in front of a warm fire or family game night. There is a powder room on this level as well, helping maintain privacy for those staying in the master bedroom. 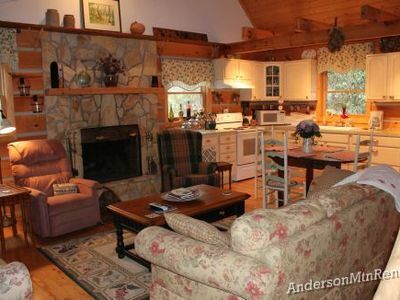 Off one side of the living area is the dining room, with large table again surrounded by windows to take in the view. 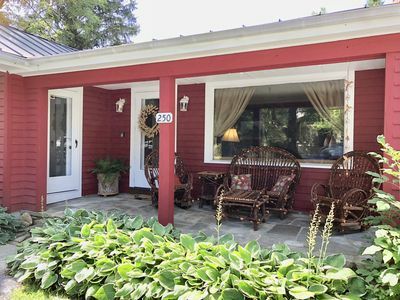 Or step outside onto one of the many decks for a large outdoor dining area and around the corner a gas grill with rockers for the “grill master” to relax in while keeping an eye on things. Adjoining the dining area is the large, modern kitchen with quality appliances and ample counter and cabinet space. There are even some cookbooks available to help get you started, and extra seating at the counter. 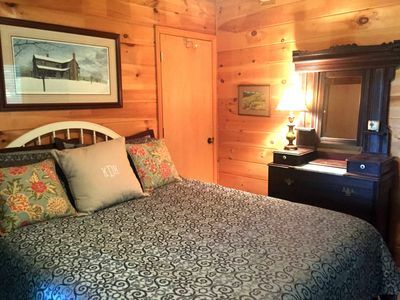 Upstairs you will find two more bedrooms, each with a queen bed, flat screen television, private deck with log furniture and private bath with tiled shower. Separating the two is the loft, with a comfy chair perfect for curling up with a good book, a desk in case anyone brought some homework along, and video game system (currently an XBox Kinect). There are high open ceilings throughout this level as well. 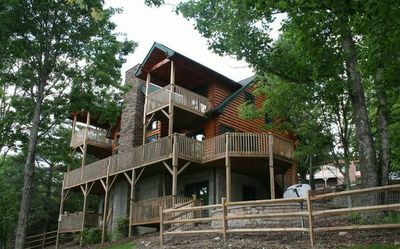 The lower level of this home features a large family room complete with its own kitchen, full bath and the fourth bedroom, again with private deck. 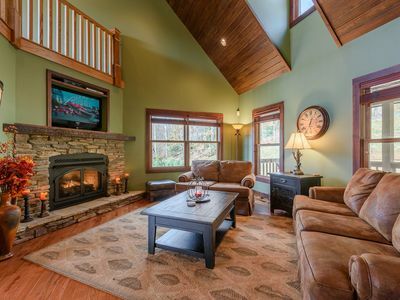 Perfect for someone who wants a little extra privacy, the family room has a seating area, table and chairs to accommodate a meal or game of cards, and large flat screen television. 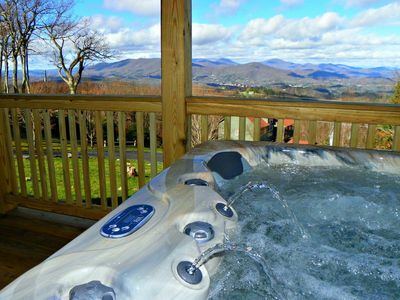 The bathroom on this level has a whirlpool tub, or step outside and enjoy the stars from the covered hot tub. 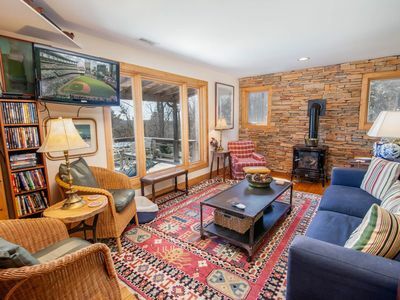 For family fun, this home has a ping pong table in the family room, video games, and on the outdoor patio area there is a firepit area complete with Adirondack seating – perfect for roasting hot dogs, marshmallows, or simply enjoying a crackling wood fire. There is also a large fenced area in back to provide a play area for young children, or a convenient option for your dog. Windswept Vistas has paved access for all but the last quarter mile - It is plowed in winter, but 4WD or AWD vehicles are required November-March, and chains may also be necessary to access all properties in winter months. 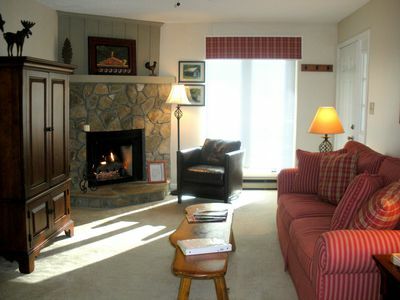 We are happy to help you find the home with the access you are most comfortable with, any time of year! 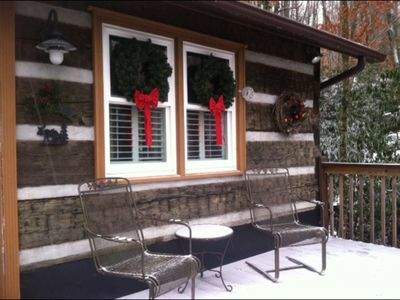 Call for special prices on last minute availability as well as for extended stays. 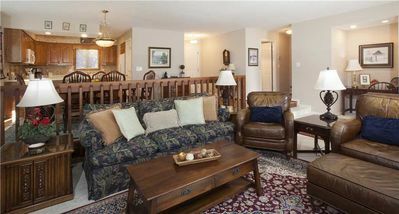 2 BR/2 BA In Town Condo- Walk to Everything in the village! 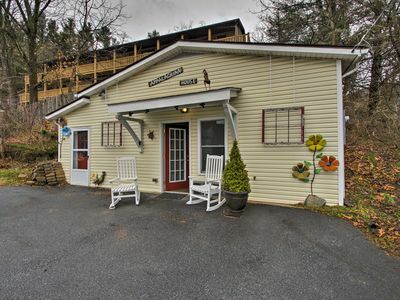 DOWNTOWN BOONE walking distance to EVERYTHING, NO HIDDEN FEES! 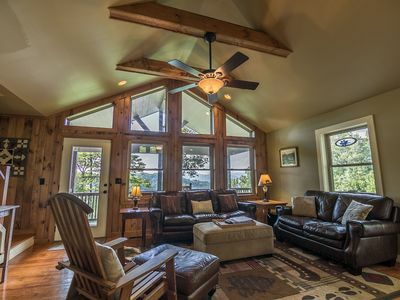 Aussies Den - Panoramic Mountain Views, Hot Tub, Pool Table! 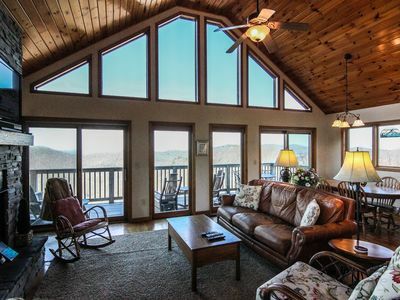 1 Amazing View - Great location, cozy, Foosball table and hot tub! 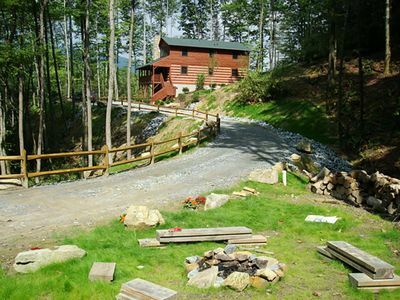 Upscale Mountain Home with Views, Hot Tub, Pool Table, near Blowing Rock, Boone, Skiing, & More. 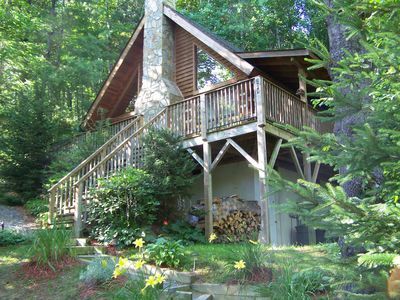 Mtn View Home w/Grill 5 Mins from Blue Ridge Pkwy!